William Peace University Biology students and professors are involved in important research concerning Polychlorinated Biphenyl (PCB) levels throughout Crabtree Creek in Wake County. “Over the years our students have examined the impact of PCB contamination on the ecology of the Crabtree Creek watershed and have tested the sediments, water and organisms, including game fish,” said Dr. Lisa Bonner, WPU Biology Department Chair. The EPA placed the Ward site on the National Priorities List (NPL) in 2003 because of contaminated fish tissue, sediment and soil resulting from facility operations. PCB has been known to cause cancer within animals and poses several other serious health risks to humans, including learning deficits, birth defects, and immune system deficiencies, according to the EPA. According to the News & Observer, PCBs were used in insulating oils to keep electric power transformers from overheating, but were later banned by Congress in 1979. Ward Transformer began operation in 1964 at its plant near RDU, eventually employing 50 workers to repair and recycle transformers for customers. 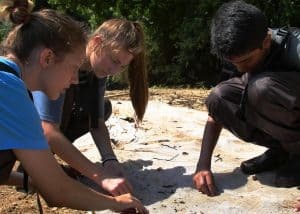 WPU Biology students Caroline Bergstrom and Sydney Melchert have been assisting Bonner and Associate Professor of Biology, Dr. Patrick Myer, in their research of the Creek. “Caroline and Sydney’s research focus has been to determine the extent of PCB contamination throughout the entire reach of the stream. All our data confirms that the contamination reaches down to the Neuse River and beyond,” Myers said. “Ward is one the EPA’s most extensive Super Fund cleanup sites in the nation, but the fish are still dangerously contaminated. Working on this research project has been really interesting,” Melchert stated. According to the EPA, the recommended, legal level of PCB in drinking water is .0005 ppm (parts per million). In fish, the safe threshold for PCB ingestion is 2.0 ppm, according to the Food and Drug Administration (FDA). 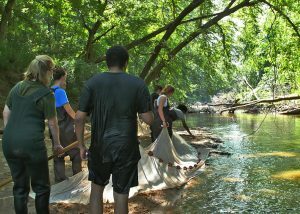 WPU Biology faculty & students have measured up to 35.7 ppm of PCB in parts of Crabtree Creek. “These are really important findings since they affect public safety and fish consumption in the Crabtree Creek watershed,” Bergstrom said. Bergstrom and Melchert will present their research findings at the National Conference on Undergraduate Research (NCUR), which will be held next month at UNC-Asheville, and the annual meeting of the Association of Southeastern Biologists (ACB) in Concord, NC, which will be held at the end of March. For more WPU news and updates, please visit www.peace.edu/news.